Unknown Facts about Indian Railways and IRCTC is always an interesting subject to all of us because many of us know just Indian railway is just a rail-road in India and just a mode of transport in India. But today here i would like to put some unknown facts about Indian railways and Irctc. India it self a worlds one of the largest economy and Indian railways is a many important role in this economy and infrastructure of India. Indian Railways is the largest rail network in Asia and the world’s second largest under one management. “IRCTC”-Indian Railways Catering and Tourism Corporation Ltd. has been set up by the Ministry of Railways with the basic purpose of hiving off entire catering and tourism activity of the railways to the new Corporation so as to professionalize and upgrade these services with public-private participation. Rail based Tourism in India will be the specific vehicle for achieving high growth in coordination with state agencies, tour operators, travel agents and the hospitality industry. A dynamic marketing strategy in association with public and private agencies, tour operators, transporters, hoteliers and local tour promoters is on the anvil. Indian Railways span global volumes in hospitality and catering sectors with services provided to 13 million passengers everyday. Indian Railways runs around 11,000 trains everyday, of which 7,000 are passenger trains. Indian Railways network is the fifth largest network in the world. The rankings are- 1) USA 2) Russia 3) China 4) Canada 5) India. IR employs about 1.6 million people, making itself the second largest commercial or utility employer in the world.IR boasts of more than 7,500 railway stations in its periphery. It has a fleet of not less than 7800 locomotives, 40,000 coaches 3,26,000 wagons. 9 pairs of Rajdhani and 13 pairs of Shatabdi Express Trains run on the rail tracks of India. Heritage Train : Darjeeling Himalayan Railways, running from New Jalpaiguri to Darjeeling, a hill station at an elevation of 2134 meters has attained the World Heritage Status from UNESCO. The Mumbai Suburban Railway system carries more than 6.1 million commuters on a daily basis and constitutes more than half of the total daily passenger capacity of the Indian Railways itself. 2. Delhi station entered Guinness book of world records for having the world’s largest route relay interlocking system. 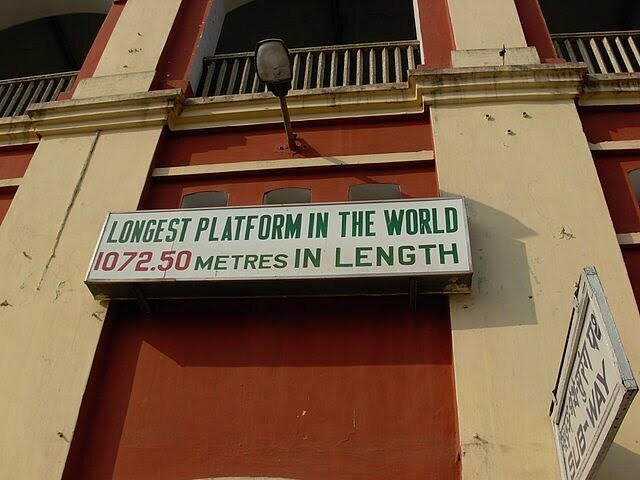 Longest Platform: Indian Railways owns the longest railway platform in the world at Kharagpur (West Bengal) with a length of 2,733 ft (1072.5 m) in length. Oldest Working Locomotive: Indian Railways still has the oldest preserved locomotive in working order, the Fairy Queen which was made way back in 1855. It is the oldest functioning steam engine in the world, which finds a place in the Guinness Book of World Records and got Heritage Award at the International Tourist Bureau, Berlin in March 2000. Highest Bridge: The world’s highest rail bridge being constructed over Chenab river in Jammu & Kashmir’s Reasi district (Chenab Bridge) will be ready by December, 2015. Coming up at Kauri, it will be 359 meters (1,180 feet) above the riverbed (five times the height of Qutub Minar and 35 metres taller than Eiffel Tower). Also, Anjikhad Railway Bridge to be completed in 2015 in Katra, Jammu-Kashmir is going to be the 4th highest in the world at 186 meters (610 feet). Stretching across a length of 424 metres, the bridge on the Panval River in Ratnagiri district, Maharashtra is currently the tallest bridge in India. So, friends see how these all Unknown Facts about Indian Railways and IRCTC are interesting. Hope you people enjoy this collective history and present facts of Indian railways and irctc. if you have a any things that i missed in listed out here, let me know to improve it better. Hope to hear from you soon,..
How to Transfer Confirmed Rail Ticket to Family Members Online? Secrete 26 unknown Israel facts and info in the world! Very Interesting. I enjoyed the post.